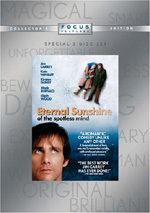 As for the audio, Eternal Sunshine of the Spotless Mind included both Dolby Digital 5.1 and DTS 5.1 soundtracks. The pair seemed identical, as I didn’t detect any differences between the two mixes. Overall, the audio seemed good, mainly due to the “inside the head” scenes. The soundfield mainly came to life on those occasions. It used the rear speakers effectively for the scenes that dealt with those elements and created a lot of cool effects. Those worked nicely, but they popped up fairly sporadically. Outside of those situations, the mix stayed pretty subdued. It offered nice stereo imaging for music and a general sense of ambience, but not much more than that. Still, enough of these occurred to make the track active and involving, and it featured the surrounds in a creative manner. This “Collector’s Edition” of Mind duplicates the original release as its first platter. 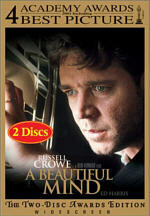 You’ll find no differences between the prior disc and this set’s DVD One. That means two things: both packages present identical picture and sound, and also all of the first disc’s extras are the same as what we got previously. I’ll discuss the new supplements in my coverage of DVD Two. 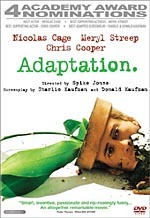 As we head to the supplements, DVD One begins with an audio commentary from director Michel Gondry and writer Charlie Kaufman. Both sit together for this running, screen-specific discussion. A definite disappointment, they don’t tell us much of substance. Gondry heavily dominates the piece. Kaufman relates no more than one or two useful tidbits, as he mostly remains silent. The extras on DVD One conclude with two components. We get a Music Video for “Light and Day” by Polyphonic Spree. I loathed the hippy-drippy Spree from the second I heard them, and this creepy video didn’t change my mind about them. It takes movie scenes and awkwardly alters the actors and settings to make them mouth the lyrics. This doesn’t sound bad, but in execution, it’s really disturbing. The Lacuna Infomercial runs 37 seconds and presents when it describes: an ad for the organization featured in the movie. It’s cute. The first DVD opens with some Previews. We get an ad for Focus Features plus ones for Vanity Fair and The Motorcycle Diaries. 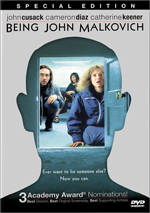 No trailer for Mind appears on this DVD. For the fresh extras, we move to DVD Two. It starts with Inside the Mind of Michel Gondry. The 19-minute and 46-second program presents statements from Gondry, Winslet, Carrey, Bregman, producer Steve Golin, production designer Dan Leigh, conceptual artist Pierre Bismuth, and director of photography Ellen Kuras. It goes into Gondry’s visual concepts for the film and the processes used to bring his ideas to life. The piece gets into the ideas well, and it includes lots of fun information such as techniques cut from the film. Next we get Anatomy of a Scene: Saratoga Avenue. This 17-minute and 18-second featurette looks at this sequence in which memories start to vanish. We get information from Bregman, Golin, Gondry, Kuras, Leigh, visual effects artist Louis Morin, and composer Jon Brion. They delve into the various components necessary to depict the material. It’s similar to the notes found in “Inside” but with a tighter focus. Good facts about the visual elements appear in this tight program. It also broadens to get into music and audio components so it covers the scene in a pretty complete manner. A companion to the similar feature on DVD One, A Conversation with Kate Winslet and Michel Gondry fills 14 minutes and 24 seconds. “Conversation” is sometimes not the right term, as the chatty Winslet dominates the program. She proves ebullient during the piece as she needles Gondry’s accent and talks about methods used on the set. Gondry chimes in often enough to ensure this doesn’t turn into a monologue, however, and this proves to be an enjoyable and informative program. Finally, DVD Two ends with seven deleted/extended scenes. This last a total of 18 minutes and 45 seconds. Mostly we see scene extensions, though we do view an unnamed girlfriend of Joel’s not found in the final cut. It’s unclear if these sequences precede his relationship with Clementine or where exactly they fall in the greater scheme of things, which means they’re interesting but less valuable due to the confusion. The longest piece comes from an extension of the first scene with Joel and Clementine alone; it goes on way too long and gets pretty tedious. Possibly the package’s cheesiest supplement, the Collector’s Edition presents a 28-page booklet. It mainly combines movie photos with snippets from positive reviews. It’s a pointless piece that seems like little more than back-patting. A pleasant surprise, Eternal Sunshine of the Spotless Mind looks trite at the start but it soon blossoms into something creative and involving. The movie doesn’t take too many predictable paths as it follows an unusual route to communicate the complications of relationships. The DVD offers fairly good picture and audio plus a pretty good set of extras. I recommended the first release of Mind and endorse this one as well - if you don’t already have the prior edition. It presents everything from the initial set plus some substantial new components. However, if you already own the original set, I find it hard to push you to double-dip. It includes a few nice elements but not enough to merit a repurchase.